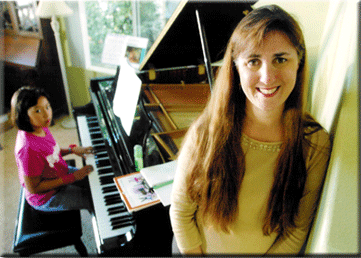 Piano and voice lessons are taught in a positive and motivational learning environment in my home in Aliso Viejo. Pianists learn to read music using an Intervallic Middle-C approach. This is the top method in the United States and ensures accelerated progress. Students develop excellent sight reading skills and confidence in playing. The intervallic approach allows the eye to quickly determine the distance between notes, creating a positive and rewarding learning process. Music theory is studied to establish a firm musical foundation for the student. If desired, vocal lessons can be taken concurrently with piano study. The monthly voice instructional class occurs the first week of the month. The remaining weeks in the month focus on piano. At recitals, those who study voice and piano perform twice – once at the piano and once as a vocalist. Vocal books with CDs are used to allow the student to easily practice in their own home.